Ultralingua French-English Dictionary is a great application that comes with up to 350,000 indexed translations with thousands of idiomatic expressions, technical terms, and slang. · Hundreds of thousands of indexed items, including tens of thousands of secondary entries. · Indications of literary, slang, and vulgar usage, and indications for usage (including synonyms, accompanying prepositions, general categories, and more); thousands of technical terms; grammatical notes concerning irregular forms for thousands of entries (plurals, past participles, future stems, etc. ; the marking of regional usage and spelling. · The ability to "float" above other applications, so Ultralingua is always available. 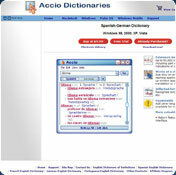 · The ability for users to create and deleter their own entries, personalizing their dictionary. · In bilingual dictionaries: a reverse translation feature, which helps show how various choices translate back into the departure language (an essential tool for zeroing in on the right word or expression). · In monolingual dictionaries: a secondary translation feature, allowing one to define a word within another definition without losing one's place. · Drag & Drop, allowing you to drag words between Ultralingua and other applications. · Comprehensive on-line language references (see individual dictionaries for specifics). · A button bar that gives one-click access to many commonly used features. · A history feature, for retracing your searches. · A tool that will translate numbers (e.g. 133) into text (e.g. "one hundred (and) thirty-three," etc.). You cannot download any crack or serial number for Ultralingua French-English Dictionary on this page. Every software that you are able to download on our site is legal. There is no crack, serial number, hack or activation key for Ultralingua French-English Dictionary present here. Our collection also doesn't contain any keygens, because keygen programs are being used in illegal ways which we do not support. All software that you can find here is freely downloadable and legal. Ultralingua French-English Dictionary installation package is prepared to be downloaded from our fast download servers. It is checked for possible viruses and is proven to be 100% clean and safe. Various leading antiviruses have been used to test Ultralingua French-English Dictionary, if it contains any viruses. No infections have been found and downloading Ultralingua French-English Dictionary is completelly problem free because of that reason. Our experts on malware detection tested Ultralingua French-English Dictionary with various spyware and malware detection programs, including fyxm.net custom malware and spyware detection, and absolutelly no malware or spyware was found in Ultralingua French-English Dictionary. All software that you can find on our servers, including Ultralingua French-English Dictionary, is either freeware, shareware or open-source, some of the software packages are demo, trial or patch versions and if possible (public domain licence), we also host official full versions of software. Because we want to be one of the fastest download sites on the web, we host all the software including Ultralingua French-English Dictionary on our servers. You cannot find here any torrents or download links that would lead you to dangerous sites. Rate Ultralingua French-English Dictionary 6.1!